It is with both great regret and enormous gratitude that I report today that Chris Murphy, my long-time assistant here at NDN, is moving on. He will be joining our good friends at Mercury LLC in the coming weeks, focusing on public affairs and media relations projects. Chris has been a terrific partner over these past few years. He is hard working, focused, kind to all and very effective. He will be hard to replace, but that process begins today. If you know of a good candidate for the position please have them email Chris right away at cmurphy@ndn.org. We will be making first cuts this Friday. The email to him should include a resume, cover note and list of references. We shoot for a person one step passed entry level for this position, for it requires a significant degree of ball juggling and complexity. It has proven to be a great stepping stone for many ambitious young center-lefties, so please send us qualified candidates today. Please thank Chris for his time served here. I know many of you got to know him well, and appreciated how easy it was to work with worth him. Please help me give him a proper send off, but as you know, like many assistants before, they never stop being part of this spirited community. The Assistant to the President is responsible for managing President Simon Rosenberg and the office's day-to-day operations. This includes managing the President's schedule; executing weekly emails including NDN's newsletter, member updates, and other releases via NGP-Van; handling administrative tasks (such as event management, meeting arrangements, scanning documents, and other errands); researching legislation or other policy information for the President's use. In this role, you will also work closely with other NDN members' offices and Washington stakeholders. This position allows for growth as well as special projects assigned by the President. Additional responsibilities consist of handling office communications, including answering the main NDN phone-line, processing invoices, assisting with travel logistics, event coordination, and keeping track of written correspondence, and other duties as assigned. We return this morning to a subject we’ve focused on over the past two years — the apparent backlash to Trump’s politics in the parts of the US with large Mexican-American populations, and potentially in Hispanic and immigrant heavy Florida too. Early 2018 data suggests this backlash continues unabated this year, making this one of the most important emerging political stories of the Trump era. CA went from 60%/37% (D/R) in 2012 to 62%/32% in 2016, a net shift of 7 points. TX went from 41.4%/57.2% to 43.2%/52.2%, a net shift of 6.8 points. AZ went from 44.5%/53.5% to 45.5%/49%, a net shift of 5.5 points. Note that much of the movement was GOP erosion, rather than Democratic gains. Digging a little deeper into 2016, Clinton lost far less ground in heavily Hispanics states like CO, FL and NV in the Presidential battleground than she did in the northern states, and she even managed to hold on and win CO and NV. Clinton only lost Arizona by 3.5 pts, a closer margin than GA, IA, NC and OH, making Arizona an official part of the national Presidential battleground for the first time in decades. Notable is the President’s strength in Ohio and Iowa, but what is perhaps most striking about this data was how low Trump’s numbers were in Arizona, Florida and of course Texas. That the second largest state in the country was now acting like a battleground state and not a safe Red confirms that something indeed is up in the border region of the US. In recent weeks we’ve gotten some early polling from statewide races in the region which also finds GOP erosion (data is from Real Clear Politics). In Arizona we find Democratic Rep. Kyrsten Sinema leading all three of her potential GOP opponents in the Flake open Senate seat by at least 6 points, receiving at least 48% in each match up. In Nevada, incumbent GOPer Dean Heller is in a dead even race against Democratic Rep. Jacky Rosen, 40%-39%. Remarkably, in Texas, Ted Cruz leads his largely unknown opponent, Beto O’Rourke, by just 3 points, 47%-44%. In Florida, incumbent Democrat Senator Bill Nelson leads the two-time elected Governor, Rick Scott, by 4 in each of two recent polls — 46% to 42% and 44% to 40%. Even the popular Republican governor of Texas, Greg Abbott, only checked in at 49–40% and 48–41% against two relatively unknown Democratic opponents in that same Texas poll. Abbott won 2014 by 21 points and is now up 8; Cruz and won in 2012 by 16 and is now up 3. While just one poll, these findings are consistent with other data showing a significant structural shift in Texas towards the Democrats of at least 7 points, and perhaps even more. To recap, Senator Heller is at 40% in NV, Governor Scott 40% and 42% in FL, Rep. McSally 42% in AZ, Senator Cruz 47% and Governor Abbott 48% and 49%. Every one of these well-known GOP officer holders are under 50%, most in the low 40s — similar to where Trump’s job approval is in these states. While early, these are bad bad numbers for the GOP and confirm significant erosion in these states for the GOP brand. It is even worse for the GOP in California. In the Gallup poll, Trump’s job approval was among the worst in the nation at 29% approve, 65% disapprove (this is a shocking result). Recent polling suggests that it is unlikely a Republican will even end up on the ballot in the general election in either the Senate or Governor’s races, something that could have a significant impact on the 7 to 9 Republican held Congressional seats thought to be in play here. According to the Cook report, all told there are between 17 and 24 GOP held House seats in play in the heavily Mexican-American states and Florida, so a strong Democratic showing and a Trumpian induced GOP fade here could be instrumental in not just giving the Senate to the Democrats, but the House too. What is causing the backlash? More research needs to be done but I would guess that Trump’s attacks on Mexico, NAFTA, immigration and immigrants themselves isn’t playing well in a region with a large number of Mexican-Americans and immigrants. The cultural, family and economic ties between this region and Mexico are significant, and Trump’s relentless hostility towards it all makes him feel like the leader of some other part of this US, and not this one. Florida is a different story of course, but is well worth watching. Trump has a long history in the state, and still spends a great deal of time there. Florida has few Mexican-Americans but many Hispanics and many immigrants, particularly of Puerto Rican and Cuban descent. The question for Florida this year is will the combination of Trump’s anti-immigrant rhetoric/policies and rough and crude treatment of Latin America and Puerto Rico create the same kind of regional rejection of Trumpism we appear to be seeing in the border region. It is too early to tell, but having a sitting two-term Governor start off his Senate race at 42% and 40% in early polling is anything but happy news for the GOP. While there has been much attention given to the President’s overtures to the Rustbelt and Midwest, it is time to consider whether in doing so he is also driving a very large part of the country, with country’s three most populous states, further away, dangerously so, from the GOP. The President is making a big bet, one that increasingly looks very risky not just for the long term future of the GOP but also for its elections prospects in 2018. Are Trump’s Mounting Legal Problems Making It Impossible for Him to Be President? Imagine if a CEO of a publicly traded company, or a university president, or the principal of your local high school, or even a Congressman or Governor, did half of what Donald Trump has done. Would they still have their jobs? The obvious answer is no, and in fact in just the last few months many chief executives and elected officials have had to resign or have been fired due to unethical or criminal behavior. 1) epic levels of personnel turnover, difficulty finding qualified help, repeated promotional of unqualified candidates, nepotism, verbal abuse of staff in public and private 2) daily instances of lying, attempts to mislead the public 3) intemperate public remarks, erosion of common civility, attacks of perceived opponents some of which could quality as defamation and slander 4) serial adultery and extraordinary efforts to conceal the affairs 5) exploding outside legal problems, involving a wide array of potential charges including treason, tax fraud, public corruption, campaign finance violations, money laundering, sexual harassment, incitement to riot 6) an unprecedented number of high level public scandals with senior officials in the government, suggesting deeply lax internal ethical controls 7) indictment of core staff close to the leader, including top political and policy staff, and now his own personal attorney and longtime business partner has had his records seized and is facing imminent criminal charges 8) clear abuse of the power of his office through his attempts to discredit an investigation into his team, the firing of prominent officials including the acting Attorney General and Director of the FBI and intimidation of those opposing him 9) appeasement of a hostile foreign power in ways inconsistent with the American national interest, including a refusal to condemn them for unprecedented attacks on the homeland of the United States. Okay, okay some Republicans say. Not a perfect guy, but he is doing a good job as President and deserves a pass. Really? 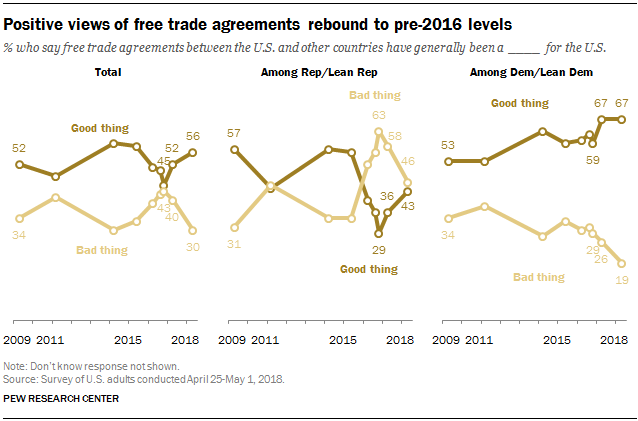 America’s standing in the world has taken an historic hit. 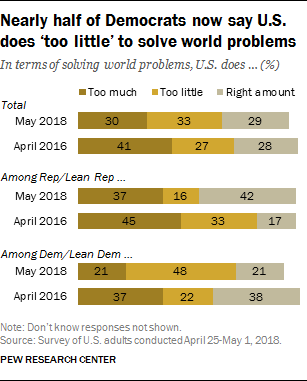 There is far more chaos on the global stage today than before, and no clear progress of any of our most vexing problems. The economy is no better than when Trump took office and is by many measures worse — job growth is slower this year, inflation fears are rising, the deficit is exploding, and the Dow is trailing similar marks in both the Obama and Clinton Presidencies. The opioid crisis continues to worsen, health care premiums are rising as is the uninsured rate, and energy prices seem to be on an upward slope. I’m sorry, the country is not demonstrably better off today due to Trump’s Presidency — so no Mad Men like performance exemption for the legal and ethical rot we’ve had to endure. So while I don’t have hope Congress will take meaningful action against Trump due to his outrageous behavior, there is another reason Congress may be forced to act this year — Trump’s mounting legal problems are making it hard for him to do the already impossible job of President. Just look at the last week. Despite all that is going on in the world, the overwhelming majority of Trump’s tweets have been about Mueller, Comey and Stormy. The RNC’s big new initiative is to attack Comey, not sell the President’s agenda. The President took the time to pardon Scooter Libby last Friday, an event the Administration made front and center in the hours leading up to their late Friday strike on Syria. There has been public confusion and mixed signals about critical issues facing the nation — stay/go in Syria, implementation of new Russian sanctions and whether to rejoin TPP. He cancelled his participation in a really important regional gathering of leaders in Latin America at the last minute. The President’s choice for Secretary of State, after firing the previous one on Twitter, doesn’t have the votes to get confirmed in the Senate. A new story out this morning has Republicans blaming the President’s erratic behavior in recent weeks for a steep decline in the standing of their signature 2018 issue, their tax cut. And the resignations in the Administration and retirements in Congress continue at rates perhaps never seen before in all of US history. He may be an ethical nightmare, but in recent weeks his government has also become a dangerously dysfunctional mess. Yesterday the Washington Post reported on the President’s response to the latest grave new legal challenge, the raid on his consigliere’s home and office: “Trump was so upset, in fact, that he had trouble concentrating on plans that were laid out for him that day by his national security team about potential options for targeted missile strikes on Syria.” And, as the story reports, the President is spending a great deal of time just trying to find legal counsel to represent him in all these matters as the lawyers he had quit, or in the case of Cohen, are themselves facing imminent criminal charges. 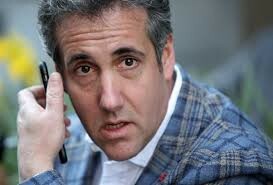 One of the reasons Trump is so overwhelmed right now is no lawyer will actually go work for him — a shocking turn of events. Any other executive of any other American venture, facing the same set of serious legal challenges, would be forced to either take a leave of absence to deal with the matters or would be forced to resign or be fired. For the reality is that any leader facing the kind of serious legal problems Trump is facing now would have a hard time finding time to do their normal job. Trump is no different. His performance these last few weeks makes it clear that the government of the United States is suffering, and that is something that Congress cannot ignore much longer. Of course there is another way for the President to remove the legal pressure on him right now — he can move aggressively to shut it all down. Which is why Mitch McConnell needs to get behind the new bi-partisan bill that would wall off the Mueller investigation from any future Trump interference. It is my own sense from watching Trump these last few weeks that he is at a breaking point, and can no longer both be President and defend himself. So something has to give. And of course what would be best is for Trump to give, and not our democracy. If the President’s legal problems continue to mount, and his performance continues to degrade, it will be time for his “board” to get off their rear ends and put the interests of nation and its 330 million people over the interests of this one terribly flawed man. It is how our democracy and broader civil society has been designed and functioned for many years now, and what has made us perhaps the most successful political project in the history of the world. Absent any significant change in coming weeks, it is time to start talking publicly about whether our President, for the good of the nation, needs to resign in order to allow him to spend the time required to address the grave legal matters facing him and his family. The Pew Research Center recently released some new data about younger voters in the US that was eye popping. It is long been known that younger voters lean towards the Democrats. But there is a post Trump shift manifesting among younger Americans in these midterms that should be scaring the Rs, and causing Democrats to be thinking about how to best to take advantage. 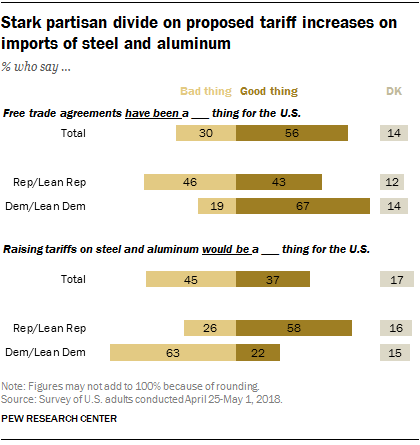 Let’s look at a few graphs from the new Pew study. First, Congressional vote intent. 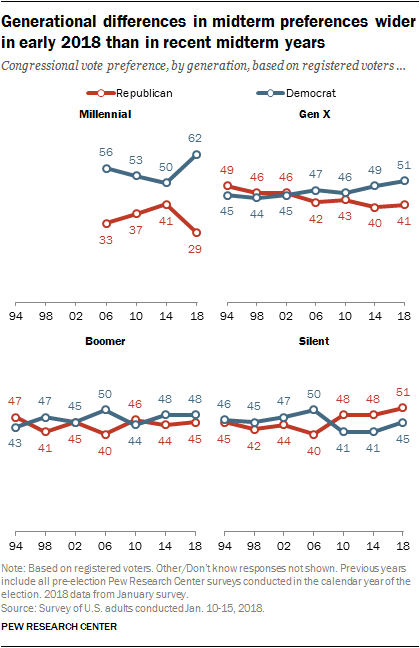 In 2014, Dems led this age cohort 50–41, 9 points. In 2018, it is 62–29, 33 points. Yes, 33 points. Next, the total number of Millennials and Post-Millennials eligible to vote has increased from 60m in 2014 to at least 76–77m this year. Let’s do a little math here. In 2014, the 60m eligible Millennials broke 50/41 D/R, yielding 30m Dem eligible voters and 24.6m Rs. In 2018, the 77m eligible Millennials and Post-Millennials are breaking 62/39 D to R, yielding a 48m to 22.3m Dem advantage. The net Dem advantage among eligible voters of this age cohort has grown from 5.4m to in 2014 to a whopping 25.7m this year. Even at a 30% to 40% turnout rate that is an awful lot of new voters available for Democrats this cycle. At 40% turnout it is a net gain of 8m new voters, at 33% it is 6.6m, at 20% it is still 5m. 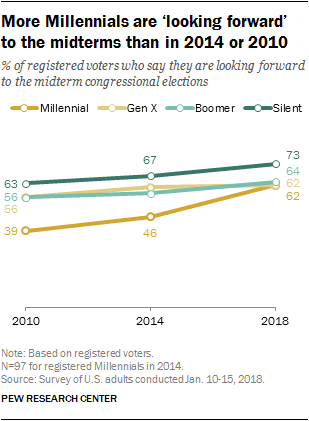 Importantly Pew isn’t picking up as big a difference in vote intent this time between younger and older voters, so the Millennial/Post-Millennial turnout is likely to be closer to the historical midterm average of 40% for all voters. In the 2014 and 2016 elections the GOP received about 5 million more votes for the House each time, so this net pick up of between 5m and 8m votes for Democrats among this age cohort is no small matter. Seem extreme to you? It did to me at first, but these large spreads for younger voters also appeared in recent elections in Virginia, Alabama and PA-18. According to the 2016 and 2017 exit polls in Virginia, there was a very big shift of younger voters in the 2017 Governor’s race. In 2016 Clinton won 18–44s 54%–38% (16 points) and 18–29s 54%–36% (18 points). In 2017 Northam won 18–44s 64%-34% (30 points) and 18–29s 69%-30% (39 points). This is a huge shift. There aren’t such easy apples to apples comparisons in AL and PA-18, but we did see similar spreads. In Alabama, according to the exit poll, Senator Doug Jones won 18–44 year olds, 61%-38%, 23 points. It was 60%-38% with 18–29s and 61%-30% with 30–44s. The final independent poll taken in PA-18 race had Lamb winning 18–49 year olds 68%-30%, though the poll was a little more Lamb than the final tally. So let’s say it was a 33–35 point spread, not 38; but factoring out the Gen Xers here could easily have had under 37 year olds in the high 30s in a plus 11 GOP House district. So, yes, if these numbers hold there are 20 million more eligible voters under the age of 37 this year who consider themselves Democrats than in the 2014 midterms. 20 million. For context, 20 million is 6% of the total population of the US. If 8m of these 20m vote in 2018, they would be equal to 11% of the 75m who voted for House candidates in 2014; at 5m 6%. So no matter how you measure it, the movement of young voters this cycle appears to be shaping up to be a consequential political and cultural development. It should be noted that a new poll just released by Harvard’s Institute of Politics has very similar findings, including 30 plus net advantage for Democrats and dramatically elevated 2018 vote intent. Democrats Need to Lean Into This Opportunity — Democrats should be having a big and loud conversation about what this big shift means for their 2018 strategy, and how to begin to remake the Party for a rising new generation in earnest. This movement obviously won’t play out the same in every state or district, but Millennial heavy places like California and Texas and even some mid-Western cities are looking at a very different electoral landscape than in 2014 or 2016. These newly available voters need to be brought into the polling and modeling of the campaigns, and campaign resources — adspend, candidate time, turnout targets — need to be adjusted to make sure these voters are being touched and asked to vote. Democrats can increase the turnout of these voters by designing campaigns crafted to speak to them, and in the process also accelerate the transformation of these new and irregular voters to more regular and reliable members of the emergent Democratic coalition. Recent reports by CIRCLE at Tufts University’s Tisch College provide interesting insights into both places where the youth vote could make the biggest difference in 2018, and the chronic underinvestment made in reaching these voters in recent elections. As these voters are less accessible by traditional television advertising, other ways of targeting them, including both paid and organic digital content (think Beto O’Rourke) will have to be more widely deployed. And efforts should be made to put younger, compelling political and cultural leaders out in front this cycle (Joe Kennedy III for example). If the movement begun by the courageous Parkland students is still going strong this fall it too could really matter, as younger voters will see their direct contemporaries taking bold action and encouraging voting in ways we’ve haven’t seen in the Millennial era; and every high school and college will be in session at the time of the November election, making mass school based mobilization easier. Republicans See This Data Too, Will Not Let These Gains Go Uncontested — Democrats should also expect very aggressive traditional and digital campaigns coming from the Rs this cycle, designed to disqualify their candidates with this age cohort. It is likely to come not just from the GOP campaigns themselves, but the many dark money groups out there and whatever it is that Trump and his new campaign manager Brad Parscale are cooking up (#ArmyofTrump). While Cambridge Analytica may not be a player in 2018, the Republicans and their allies, here and abroad, learned a lot about how to damage Democratic politicians using these new digital tools in 2016. We should expect many locally tailored, copycat digital efforts in 2018, ones that will feed into a localized right wing media ecosystem that not only includes millions of dollars of dark/independent television ads, long established local talk radio show hosts, but now dozens of new Sinclair television stations too. For all the talk of the Trump base and Obama-Trump voters, there are also signs of backlash to Trump out there this year. I’ve written about the erosion of the GOP brand in the Southwest Border region, and clearly women are driving a great deal of the big shift in US politics these days. But the scale of the rejection by younger Americans of Trump’s GOP is huge by any measure, and will impact not just 2018 but American politics for years to come. (A note on the data in this post — see here for how Pew defines Millennial, which is a bit different than others. 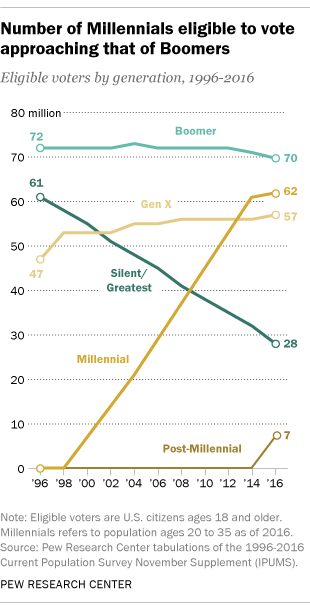 For 2018 Pew has Gen Xers 38–53 years old, Millennial 22–37, Post-Millennials 18–21. In this post, we treat Post-Millennials as Millennials as there is not a lot of data about their political views out there, and initial evidence is that they are tracking Millennials in political orientation). As is our tradition, we come to you with asks for support only a few times a year, and only when it matters. We are aware of how critical it is that our collective political capital stays focused on the upcoming elections, which are perhaps the most important in my many years in politics. So we are not asking to divert too much of your limited capital today towards NDN – just enough to keep us doing the important work we do to get ahead, tackle the next challenge, define the terms of coming debate – the work we’ve been doing for more than a decade now. To meet that work is more important than ever because whatever Trump represents he has jumbled the issue and political landscape of the country. Everything is different now, and many long held assumptions need to be rethought completely. For the center-left to succeed in the coming years, we will need a comprehensive response to Trump, and one that cannot be about restoration but more about reinvention and innovation – going forward, not back. Going forward, not back – that is what this organization has been about in its many forms for many years now. We have always been guided by a simple belief that the world was changing – globalization and the “rise of the rest,” advances in tech, large changes in our demography and our media – and these changes required new and compelling responses. We may have to add another disruption – the Trump presidency itself – to that list of disruptions if we are to be successful in the coming years. Which is why we keep doing our work, offering data-driven thoughtful analyses to help guide our leaders through these turbulent times. If you want to keep supporting our important work, please do so today. Any amount matters – $25, $50 or more. Our goal is to raise $25,000 from our community in the coming weeks, and if we can do so we can make our budget targets for the spring and keep contributing to the national debate in ways that add value, and move things forward. Join with us in any way you can, today, and thanks again for your interest and support of our work. As some of you may know, I’ve been working for the past several months outside of NDN to get a new company off the ground in the info/disinfo space. Called Discourse Intelligence, it did good work in both the Virginia and Alabama races last year, and is gearing up to play a major role in 2018. The company grew out of research NDN commissioned last year from our long-time friend and collaborator, Tim Chambers. You can read his compelling paper here. Unfortunately, due to unresolvable disagreements among the founders about direction and strategy, this week I decided to leave this promising company. These things happen in startups, and I felt it best to walk away before these disagreements became even more debilitating to the company and its important mission. I have learned a lot about the new media ecosystem in working with the talented team at Discourse over the last few months, and intend to apply it aggressively in my work with NDN and others in the days ahead. All of us have to do our part in the coming days to make our democracy and our discourse far healthier. With your help, we here at NDN will continue to try to lead the way.